Transfer your balance to a new Visa Platinum Credit Card, and get ZERO percent introductory APR* on your balance transfer for 6 months. Learn more about our Visa credit and gift card options. 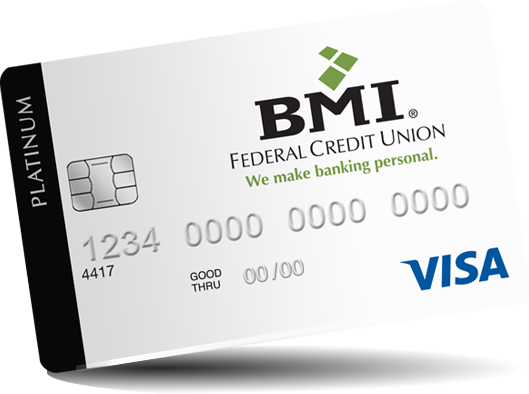 Your BMI Federal Credit Union Visa Credit Card is accepted throughout Central Ohio at millions of locations worldwide and gives you access to cash at ATMs displaying the Visa/PLUS symbol. 0.00% Introductory APR for 6 months from the first balance transfer. **Visa Card Alerts are provided at no additional cost. However, you may incur charges to send or receive information for internet, cellular or other data services from your wireless carrier. MyCardRules is a mobile application developed and maintained by Jack Henry and Associates for financial institutions that use JHA Card Processing SolutionsTM card processing.